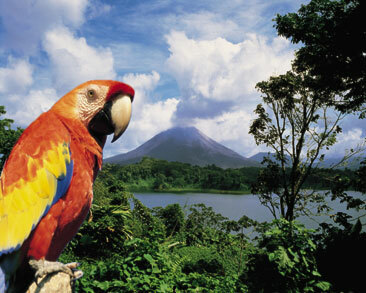 The population of Costa Rica is about 4.5 million, and the main ethnic group is of European origin. A small percentage of the population, about 6%, is made up of Chinese, Amerindians, and people of African origin. Spanish is the official language with a Creole dialect generally understood all over the country. Education is compulsory giving it a literacy rate of over 96 percent. Most of the population is in the service industry, with industries giving livelihood to 22% of the population, while a small 13% of the people list agriculture as their main occupation. Tourism is a major money earner for the country. This small country has lush rainforest, tropical beaches and active volcanoes. The Central highlands have very fertile soil and half of the total population lives there. The city of San Jose, the capital and largest city, has over a million people. 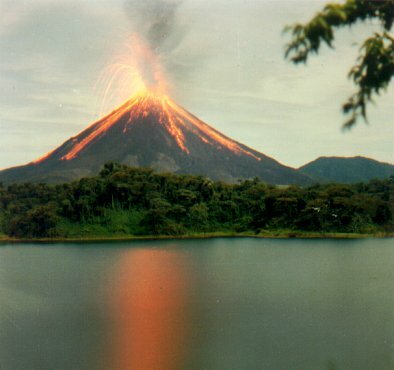 Mt Arenal is an active volcano that draws many tourists each year. The coast on the Caribbean Sea has many mangroves, swamps and sandy beaches, and the city of Puerto Limon, a very popular tourist destination. The coastline on the Pacific Ocean is over 620 miles long and is more rugged and rocky. There are a number of famous surfing spots and some national parks in this region. 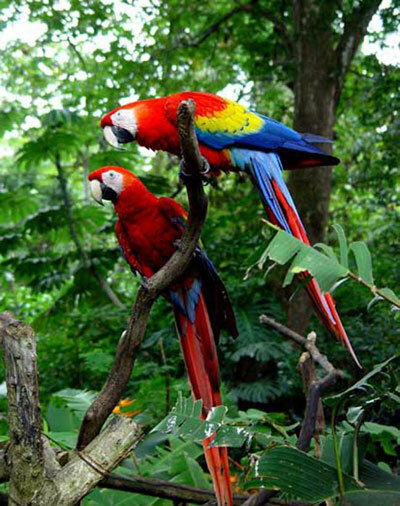 Forests in Costa Rica are either tropical of dry forests, and each has their own rich fauna. National parks cover 12% of the total land area in the country. 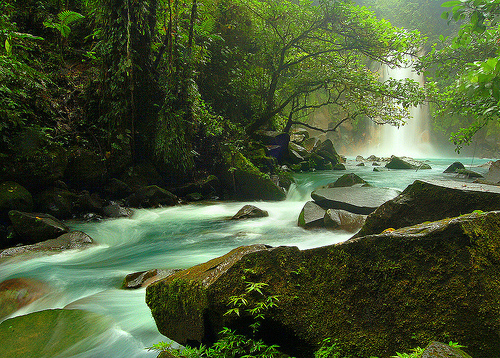 Costa Rica was an intermediate area between the Mesoamerican and Andean cultural regions. Columbus is said to have made the first entry into the area by Europeans. The country was captured by the Spanish in the sixteenth century and was part of the Spanish territory of New Spain under the military governor in Guatemala. Agriculture was established as a means to develop the country after efforts to find gold and other minerals failed. Banana and coffee plantations became the mainstay of the economy. Costa Rica joined other Central American areas that declared themselves independent of Spain in 1821. It became a part of the Republic of Central America until it formally withdrew and declared independence in 1838. Some Americans tried to enter Costa Rica to exploit the slave trade but were driven out of the country by the then Costa Rican army. Some of the people who took part in that war are still remembered as national heroes. The Palo Verde National Park has a spectacular population of native and migratory birds and tourists can hike along a number of trails in the forest. 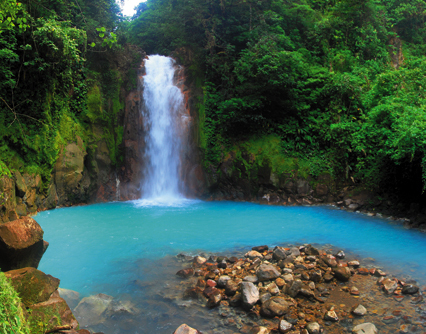 La Fortuna de Bagaces is another spot where you can see swimming holes formed by spectacular waterfalls. The area has geysers and mud pots as well as natural hot springs. The villagers there will host a bullfight if they have enough of an audience. If spelunking fascinates you, you must visit the Barra Honda caverns. These have small entrances that lead to the limestone caverns to protect them from the depredations of visitors. The Santa Rosa National Park is one of the rare tropical dry forests in the world that allows extended exploration. Nature cruises through the wetlands will reveal a lot of wildlife. 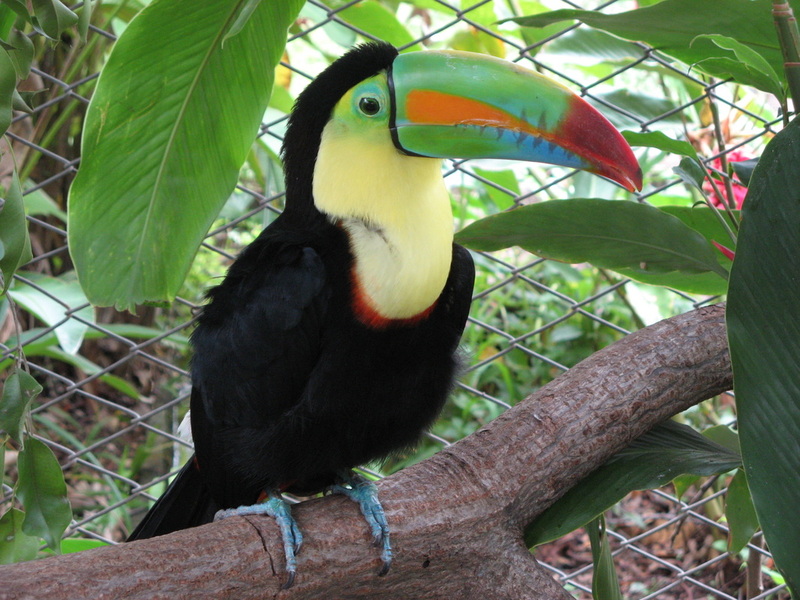 Monteverde is a private reserve where you may see cloud forests and cool, wet, and windy weather all in the same area. If you are the adventurous type you can look for the nightspots that have casinos and also have your fill of betting on sports all over the world. You can enlist in dance classes if you want to jive with the rest of the crowd in the various nightclubs that are in all cities in Costa Rica. Or if you just want to relax there are a number of health clubs and spas, or you can even travel to the Arenal volcano area to soak in some natural hot springs. If you get to downtown San Jose you can find a lot of live music, mariachi bands, and discos as well as many good restaurants. There is a very heavy influence of Spanish culture due to the long occupation by the Spaniards, lasting for two centuries. The language of the country is Spanish but the Costa Ricans have their own particular patterns while speaking the language. The respect shown by use of the word "Usted" in place of the informal pronoun "tu", surprises other Spanish speakers, and the accent shows the influence of the Colombians. The official religion of the country is Catholicism, and one of the most common festivals in all areas involves people walking to the church or cathedral in their area that has a representation of the Virgin Mary. 14% of the population practices the Protestant faith while a small section adheres to Islam, Judaism and others as their religion. Cuisine in Costa Rica is mild, not spicy, and relies heavily on fresh fruit and vegetables. The main food for every meal is gallo pinto, a dish made with rice and black beans. Every meal is topped of with candy. Casado is the same dish, but the rice and beans are served separately. Meat in the form of fish, pork, or chicken is served along with salad. Fried plantain may accompany some meals as well as a slice of cheese and corn tortillas. A brown sauce called Salsa Lizano is a must on all Costa Rican tables and has a flavoring of black pepper and cumin in its slightly sweet makeup. Fresh vegetables are served at all meals with members of the squash or gourd family among the most common. Coffee and banana are locally grown produce and will form a part of most Costa Rican cuisine. Sweet corn dishes are also very common on Costa Rican menus.